William Meath Baker was the only son of Revd. Ralph Bourne Baker. Revd. Ralph Bourne Baker was the brother of William Baker who left all his estates to him on his death in 1865. William Meath Baker continued the family tradition of public benefaction. He built Fenton town hall at his own expense. 1863 William Baker IV (his uncle) bought an estate called Hasfield Court, in Gloucestershire. 1865 William Baker dies and WMB's father inherited the estates - the family move to Hasfield. He was a keen mountain climber often climbing in the Swiss Alps. In 1863 William Baker IV (the uncle of William Meath Baker) bought an estate called Hasfield Court, in Gloucestershire. William made plans to change it by refacing the brick walls with stone and adding a porch, but he died before the move was accomplished and the alterations were completed by his brother Ralph. William died on the 16th of August 1865 and the Staffordshire Advertiser reported that the day of his funeral was one of general mourning in Fenton. He was buried in Fenton Churchyard and the funeral was attended by many of the workers from his factory. 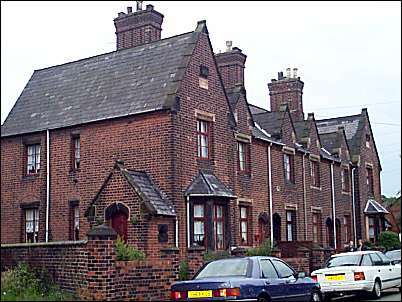 His brother, the Rev Ralph Bourne Baker inherited the factory and the estates at Hasfield, Gloucestershire and Doveridge Woodhouse. He married the Bishop of Meath’s daughter, Francis Crofton Singer, and they lived at Hilderstone where he was the incumbent until 1860. At the beginning of 1886 William Meath Baker offered to build a new town hail for Fenton. In April 1888 he submitted plans to Fenton Local Board of Health for three new streets which were subsequently named Station Street, Baker Street and Gimson Street. In the mid 1880s William Meath Baker demolished the cottages on the east side of his factory fronting High Street (now City Road) and what later became Victoria Square. 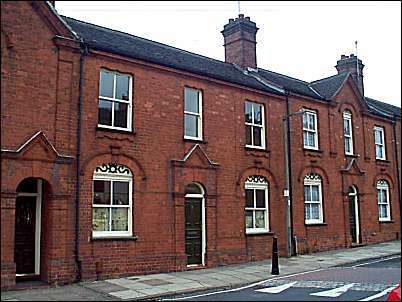 Here in 1885 he constructed 30 houses with ornate frontages decorated with moulded brickwork and terracotta tiles. Four years later the Fenton Local Board of Health Board built public urinals in the Square. On the left are the houses W.M.B built - the public urinal in front. In the meantime William Meath Baker submitted plans for a new street off Victoria Road in December 1889 which was named Hitchman Street. 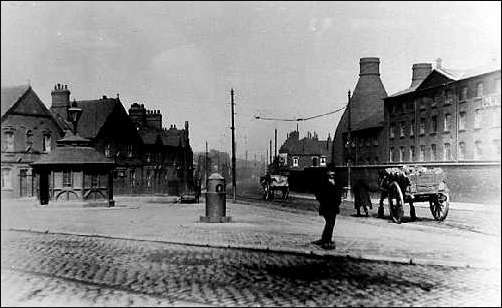 Here on a triangular site which also faced Victoria Road he built 12 houses and a shop in the same style as the houses fronting High Street and Victoria Square. In the early 1930s William Meath Baker began to wind down his interests in Fenton. In 1931 Fenton House was sold to the parish. The factory ceased trading during the great depression in 1932. The premises is now occupied by Kames Kent (Ceramic Materials) Ltd. though all the buildings on the site date from after 1932. William Meath Baker died in 1935 but his descendants still (2000) own some property in the area including the houses in Hitchman Street and Victoria Place. The story is told of how Elgar (who was a friend of W.M.B) , returning home from giving violin lessons, sat down at the piano and, to unwind, began improvising. William Meath Baker, "country squire, gentleman and scholar" is said to be informing his guests of the day's arrangements when W. M. B. had a party at his estate and ordered horses and carts for transportation. He read the list of guests to the crowd, ran out of the music room and slammed the door. A quick staccato version of the first part of the theme followed by a fortissimo rendering in the major section. This latter is accompanied by boldly undulating passages for the strings. The whole variation working up into a magnificent outburst from the whole orchestra, with the rhythm marked by the drums. Porte in this book feels that Elgar painted WMB as "impetuous."